My mum and dad were two Dorchester Meeting House Hill kids when they met. My mum was born on Westwood St and grew up on Coleman St. My dad joined the army. This led them both to Ft. Sheridan in Illinois where I was born. My mum would head back home soon after I was born and I would not see my dad for 30 years. My early childhood was wonderful. My mum, being a single mother to me and my sister Michelle did everything to make our life great. We first lived in the projects of Columbia Point, first at 10 Blair Road and then 164 Monticello Ave. It was a tough place to live but we did not know any differently and dealt with it. My summers were fun because my mum would send me off to Camp Aggasiz in Maine. We left Columbia Point in the late sixties and started to live all over Dorchester. We lived at the corner of Bakersfield and Willis Streets, then Church and Winter, and Victory Rd and Adams. It was at Bakersfield and Willis where my brother Chris Tiger Stockbridge joined our family. After he was born we went to Adams Street in Lower Mills where my mum became a home owner for the first time. Money was always tight, especially my mum being a single mum in the 60’s and 70’s. My schooling was an example of this. I started at St. Mary’s in South Boston. It was known as the polish school because a lot of the folks from the Polish Triangle area attended it. My dad was Polish and naturally so am I. By the fifth grade I had to go to public school. I attended the Mather for 5th and 6th grade and then the Southworth for 7th, but it burned down during the Christmas break. I transferred over to the Russell. Then court ordered busing happened and I spent my 8th grade at St. Ambrose. My high school years were great. I attended St Mary’s School in Cambridge. Our most famous student was Anthony of Prince Spaghetti fame. I worked at the Woolworths on Mass Avenue to pay for my high school tuition. I even had a second job after my shift at Woolworths cleaning offices for TAD Associates. I was a teenager learning valuable life lessons. My teenage years would set the foundation of my life. I ran with a group of kids from the Mattapan projects. It is now called the Morton – Gallivan Housing Development. Here we experienced and experimented with life. We learned the values of trust, loyalty, and friendship. We developed the bonds that are never broken. My two favorite accomplishments during my teenage years was winning a chess tournament at the Murphy School and winning the travel league bowling championship for Boston Bowl. I loved to play chess and bowl. I did not play organized baseball, hockey, football, or basketball. I played all those sports as pickup games with my friends. We would challenge each other or whoever else was around. Some of this experimenting led to an early decision in life to get sober. I am proud to say I have over 30 years of sobriety. I wish I could say that for my three other friends who attempted to do the same thing. Two are dead but the other is doing great. Becoming a role model for my younger brother was the driving force that kept me on that track early in my decision. I met my wife Joyce when I was working at the Little Peach in Lower Mills. She came in to buy a soda and I was taken back by her smile and her personality. I knew I wanted to know more about her. She made the mistake of telling me her first name and where she worked. So I call a few times to see if we could go out. (Nowadays it is known as stalking). Finally she agreed and brought her friend to the first meet at Sonny’s Restaurant in Adams Village. Well her friend knew me and Joyce has been stuck with me since: and Maureen did become our maid of honor. I started my career under Mayor Flynn. It was a family friend that recommended me for a job at Code Enforcement Police. I interviewed with Richard Iannella and because his dad Chris Sr. recommended me I started two weeks later. Soon after Mayor Flynn left for Italy and Mayor Menino took over for the next 21 years. Now I did not start out as a supporter of Mayor Menino. Remember my mum and my friends taught me the value of loyalty. So I was helping Jim Brett when I was not helping my good friend Richard Iannella run for city councilor at large. I always believed it important to support the people who support you. Well Jimmy lost and Boston had made her decision. Little did I know how their decision would enhance my life and the citizens of Boston. Sometime after the election my friend Bill Fenton called and asked if I was willing to assist in matters with him. I said yes. My time serving under Mayor Menino will never be matched in my life time. It was amazing. I and my team were able to take a floundering, not too respected city agency and make it great. We were able to advance technology and have new laws enacted that has really helped enhance the quality of life for Boston’s residents. When you get a citation from CEP it has a photo of the violation in real time on the citation and if you do not pay it, The Green Bill allows it to be placed as a tax lien on your property. This was just my work experience with Mayor Menino. I came to know him personally over the years through his daughter Susan. It was my first experience understanding and knowing a person of such responsibilities as a human being. I was so comfortable around him; I did not see him as the mayor. I think most of Boston got that way too. Now I am serving under my third mayor; Marty Walsh. I knew Marty when he would coach for Savin Hill Baseball and I was and still am coaching in Cedar Grove Baseball. I also remember the time I was dressed as Santa Claus for the Dorchester Day Parade and Marty was getting ready to march. He had the All Roads Lead to Dorchester t-shirt with his bumper sticker silk screened on it. He was gracious enough to give one to me and I wore it all day after I got out of the Santa outfit. Now he is Mayor and it is too early to judge. I am now the elder employee of times past and get to watch as younger city employees try to accomplish their goals. I now know this takes a career and not one term. I started my journey with the City of Boston on January 15, 1991. I am presently still on that journey. I spent the first half at 152 North St and the second half of it at 1010 Mass Ave. CEP has been passed around over the years. It started with ISD, Municipal Police, PFD, DND, Property Management and back to ISD. It it is now over at DPW. During our journey we accomplished our goal each and every day. To do good and enhance the quality of life for Boston’s residents. Most of my team that carried out this day to day effort have moved in their careers and have also reached lofty goals in their lives. They have married, bought homes, had children and continue to serve Boston in their work. This is what I am most proud of as their co-worker. I believe in building teams and working hard. It is only way I know how to get the done. It is how I live my life. I haven’t always been a city worker. I went to Newbury College nights and received a degree in paralegal. I took my degree and went to work in a mail room of a law firm and was ready to roll up my sleeves and work my way up the corporate ladder. The firm lost their largest client so I started to look around for another job and was hired for Code Enforcement Police. My first job was at age 13 selling the Herald American subscriptions door to door. I worked helping to deliver laundry right after that job. I bussed tables at the Dilly Deli across from Fenway Park in 1975, the World Series year. I worked at Woolworths during high school and a second job at TAD Associated cleaning their offices at the same time. I did a stint at Bickford’s in Neponset Circle, I put pegs in a tic tack toe board in Watertown, I worked at the Jordan Dennis Mailing Co which is now the home of Lucy’s American Tavern. I also worked at the Stop and Shop Warehouse and the Little Peach Convenience Store. Like a lot of the places I shared as previous places of work, Boston continues to change. The cost of housing and the creation of condos have forced many of her neighborhood families to leave their familiar streets and move to other cities and some have been lucky enough to find a place to live in Dorchester. I see more and more folks from South Boston coming to Dorchester. Life-long city residents and families are trying to hang on to the intangibles of city life. It is these intangibles that led me to be a volunteer in many Dorchester groups including especially the Lower Mills Civic where I am still active for over 20 years. It’s been 29 years and I’m still coaching at Cedar Grove Baseball. I’ve been 16 years with Democratic Ward 17; co-founded the Dorchester Holiday Celebration Committee and I served as president of Dorchester Day Parade Committee. In the year 200 I was chosen to be the Mayor of Dorchester. I served on the Dorchester Ave re-zoning committee, and have been a political mercenary on many campaigns. I am running for the third time for the office of Suffolk County Register of Deeds because I believe my life struggles, lessons, and accomplishments will allow me to build a successful team and help enhance the office of Registry of Deeds. I will go in and roll up my sleeves and use my beliefs of hard work and loyalty to be a great team leader for the office. I will lead by example. It is the only way I know how to. Ed. Note. 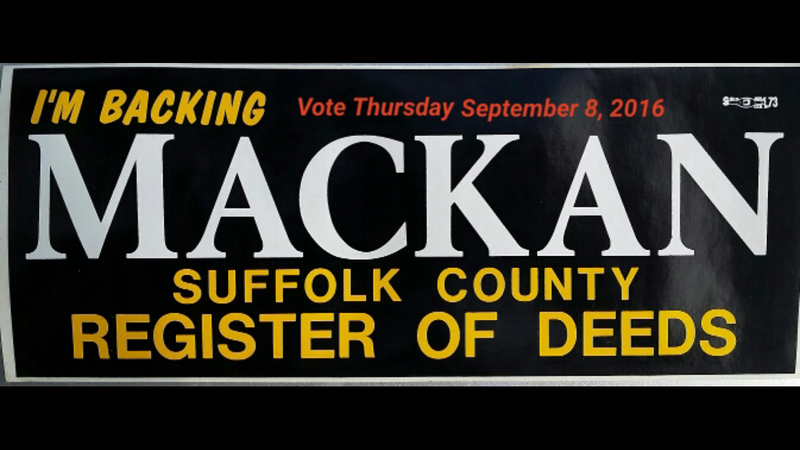 The election for Suffolk County Register Deeds will take place on Thursday, September 8, 2016. This is a State Primary Election and Mike will be on the Democratic Ballot. The final election will take place in November during the presidential election.